Wonderfully creamy New England Clam Chowder is way easier than you think to make at home and about to become a new family favorite! 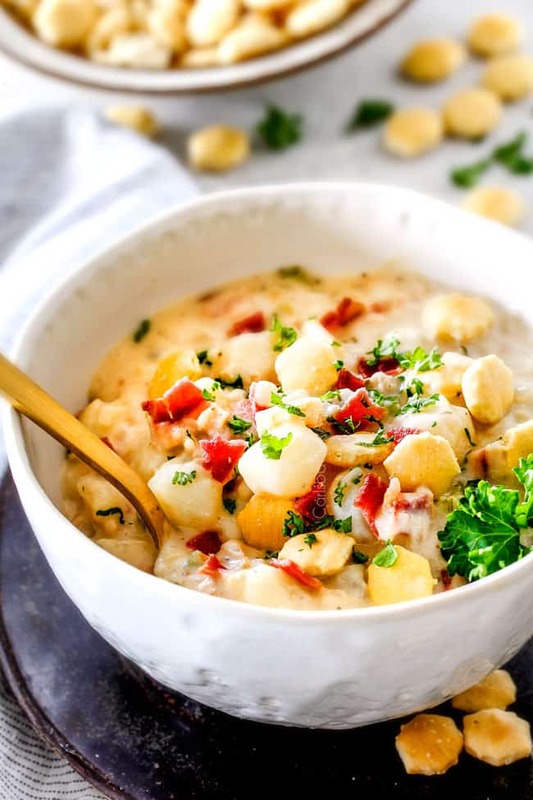 New England Clam Chowder is hearty, thick, creamy and loaded with tender clams, creamy potatoes and salty, smoky bacon in a rich flavor bursting broth! 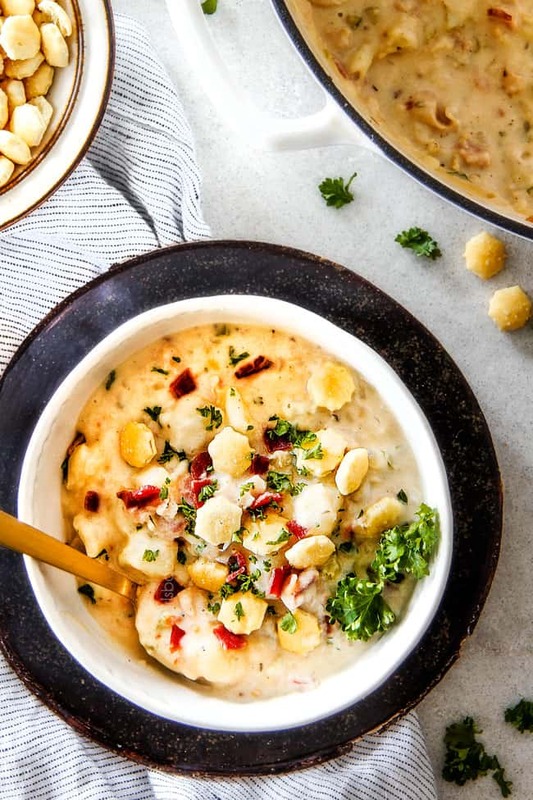 Homemade Clam Chowder might seem intimidating but you will be AMAZED at just how quick and easy it is to make at home in just one pot. I’ve detailed how to use fresh clams or canned clams to make a New England Clam Chowder to rival your favorite restaurant. 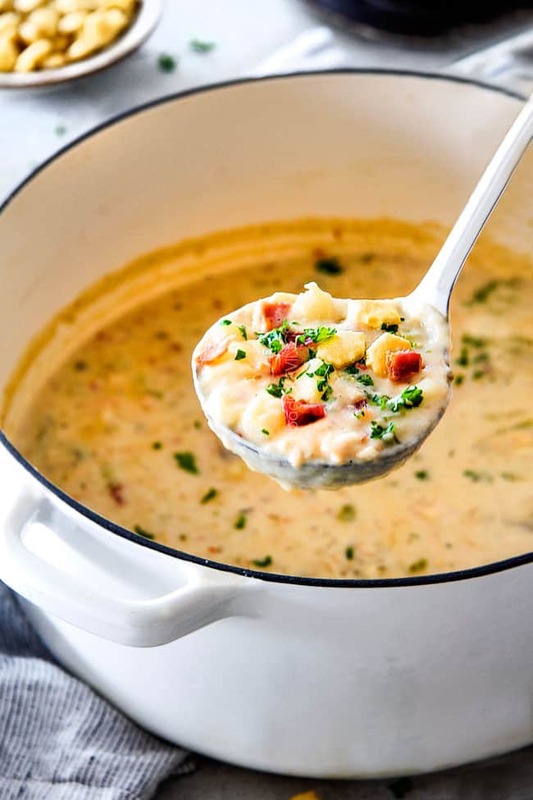 If you’re not sure you love New England Clam Chowder, this recipe will convert you! I lived in Solana Beach for 5 years (by the Del Mar racetrack in San Diego) in my late teens/early twenties and down the street was the iconic Fish Market with the best New England Clam Chowder. My friends and I would buy a quart for $8 which came with oyster crackers and a huge slab of bread. We would drive a few blocks west to the ocean and sit on the bluffs as we devoured our rich and satisfying chowder. It was then that I fell in love with New England Clam Chowder. And I fell hard. 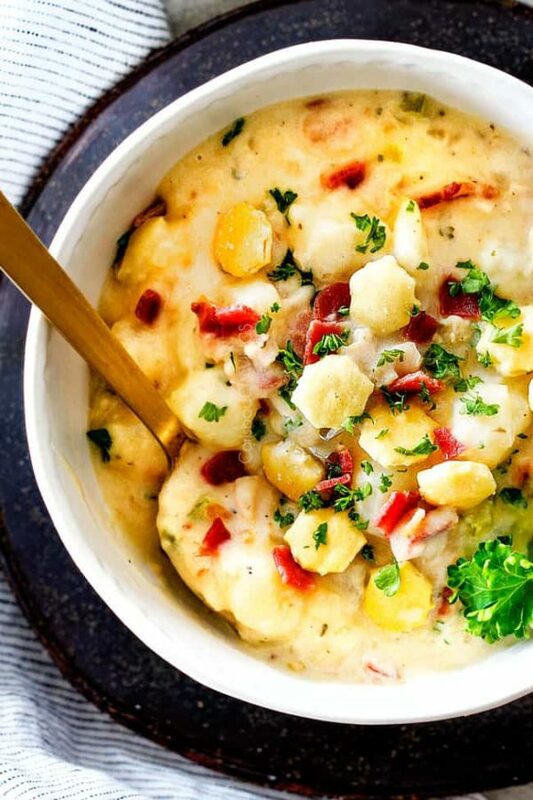 I would crave the white creamy chowder bursting with delectable clams, tender potatoes, and salty bacon. Little did I know just how easy it is to make restaurant quality New England Clam Chowder at home or I would have been making it weekly! So now that I know how easy it is, I want YOU to know how easy it is! You will never go back to any canned/carton variety again because this Clam Chowder is perfection. WHAT ARE THE DIFFERENT TYPES OF CLAM CHOWDER? If you aren’t familiar with New England Clam Chowder, then you might wonder what the difference is between New England Clam Chowder and the other varieties. Manhattan Clam Chowder, on the other hand, is where the tomatoes are at. It features a clear tomato broth and is essentially a vegetables soup with clams. Of both varieties, I can’t pull my spoon away from lusciously creamy New England Clam Chowder and I think you’ll agree! What Clams Should I use for New England Clam Chowder? You can use either canned or fresh clams for New England Clam Chowder -whatever is most convenient or you and fits your budget. I’ve outlined how to use canned clams and how to use fresh clams below and in the actual recipe so there are no excuses not to make homemade clam chowder! Can I Make New England Clam Chowder with Canned Clams? Yes! Seeing as San Diego is on the opposite side of the Unites States from New England, fresh clams can be hard to come by or very expensive, so I’ve made this New England Clam chowder with minced canned clams and I couldn’t taste a difference! In fact, many reputable restaurants use canned clams with the addition of clam juice. You will be shocked how restaurant-quality delicious this version tastes and canned clams make it that much easier! What Canned Clams Should I use? You will need three (6.5 oz) cans chopped/minced clams in clam juice. These clams are located near the canned tuna fish in your grocery story. We drain the clams and reserve the clam juice and add bottled clam juice to equal 2 ½ cups total clam juice. The bottled clam juice can also be found near the clams in your grocery store. What fresh clams should I use for New England Clam Chowder? You can also make New England Clam Chowder with fresh clams. If you are going the fresh clam route then I recommend using fresh cherrystone clams. Cherrystone clams are more tender than quahogs (which is always a good thing). That being said, quahogs are commonly used because they are less expensive and will still work. Steaming fresh clams is actually quite simple and creates its own clam juice so you will use this clam stock instead of the bottled clam juice listed in the ingredients. Let’s get to it! SCRUB your shells very well. Add 3 cups water to a Dutch oven and bring to a boil. Add clams, cover, and cook on high heat for 5 minutes. Stir clams, cover and cook an additional 2 minutes. Uncover and remove any open clams. Continue to simmer and remove clams as they open up. Discard any unopened clams. Drain the clams and reserve stock, scoop out the meat, and coarsely chop. Set the clams aside to add to the chowder at the very end of cooking. Like the canned clams, we are just HEATING the clams and not cooking the clams. If you add them any sooner to the chowder then they will become rubbery. Strain the stock from the pot through a mesh strainer lined with a coffee filter and add to a measuring cup to equal 2 1/2 cups. Add additional water to equal 2 1/2 cups if needed. What Kind of Bacon Should I Use? You will want to use thick, center cut bacon opposed to traditional sliced bacon. Sliced bacon wilts as its simmered whereas thick bacon holds up to the heat so you are left with a wonderful meaty texture that compliments the clams. The key to cooking thick bacon is low and slow so that the fat renders out completely without letting the bacon burn. This gives you a great base to sweat your vegetables. The potatoes for New England Clam Chowder come down to personal preference. Yukon Gold: This is my favorite potato for soups. It is a waxy potato so it retains its shape well and is hard to overcook. It tastes soft, buttery and melt-in-your-mouth tender without ever tasting mealy. Russet Potatoes: They boast a soft, creamy, melt-in-your-mouth texture, taste the most “potato-y” and practically fall apart in your mouth. The tricky thing about Russet potatoes is you don’t want them to actually fall apart, so you have to take care not to overcook them. What Seasonings for Clam Chowder? Both bacon and clams are wonderfully salty so we don’t need to add a lot of seasonings. To this New England Clam Chowder, I’ve seasoned it with dried parsley, red pepper, oregano, dried thyme, pepper and aromatic onions an garlic. I suggest adding 2 teaspoons chicken bouillon to your clam chowder if you are using canned clams. The salty bouillon enhances the natural flavors and mimics the saltiness of the fresh clams and juice. This extra touch elevates this New England Clam Chowder to a whole new level. If using fresh clams, I would omit the chicken bouillon then add a little to taste if it still feels like is missing a little something-something. Now that you have your clams all ready to go, it’s time to make New England Clam Chowder! You will LOVE how easy this clam chowder is to make with gourmet results. Simply cook chopped bacon in a large Dutch oven then remove half to garnish the clam chowder with at the end of cooking. Next, cook your onions and celery in the bacon drippings for dynamic flavor followed by potatoes, garlic and red pepper. Sprinkle in some flour and cook for one minute to get rid of the raw flour smell then stir in chicken broth, clam juice and all seasonings. Simmer, uncovered, for 15-20 minutes or until potatoes are very tender then stir in heavy cream followed by clams. That’s it for decadently delicious New England Clam Chowder! They key to preventing rubbery clams is to not overcook them. After we’ve simmered the clam chowder and the potatoes are fork tender, then add the clams to the soup. You do not want to cook your clams, you just want to HEAT them so add them at the very end of cooking. How do you thicken New England clam chowder? Cornstarch: Remove 1/4 cup broth from the clam chowder and whisk in 1-2 tablespoons cornstarch with a fork (depending on how much thicker you want it) until smooth then whisk it back into the chowder. Simmer until thickened to desired consistency. Flour and butter: Mix equal parts flour and softened butter together with a fork so it becomes a thick paste and almost forms a ball. You will want 2-4 tablespoons each, depending on how thick you want the chowder. Add it to the chowder, and simmer until thickened, stirring occasionally. Puree soup: Remove 1-2 cups of the chowder and puree it in your blender or food processor. It will add body to the soup while preserving the flavor. Mash potatoes: Remove some of the potatoes, mash them and return them to the soup. Mashed potatoes are a natural thickener. Alternatively, you can microwave a few potatoes separately, mash them and add them to the soup if you don’t want to use any from the chowder. What Should I serve with Clam Chowder? To finish the New England Clam Chowder, pile it with some of the reserved crispy bacon and fresh parsley for an added explosion of YUM! I love serving New England Clam Chowder with a big chunk of bread and oyster crackers. I love the salty crunch oyster crackers add to the chowder. If you can’t find oyster crackers than saltine crackers are also delicious. It is also delicious with a big green salad, wedge salad, breadsticks, dinner rolls and fruit salad. How Long is Clam Chowder Good for? New England Clam Chowder should be stored in an airtight container in your refrigerator. When properly stored, clam chowder is good for 3-5 days. Can I make Clam Chowder Ahead of Time? The flavors of this New England Clam Chowder only gets better the next day so this chowder makes fantastic leftovers. It will thicken as it stands overnight in the refrigerator so just whisk in a little milk before reheating. Can I Freeze Clam Chowder? I do NOT recommend freezing clam chowder. Cream based soups do not freeze well as the fat separates when frozen and defrosted. Potatoes also don’t freeze well as their texture becomes mealy and mushy. 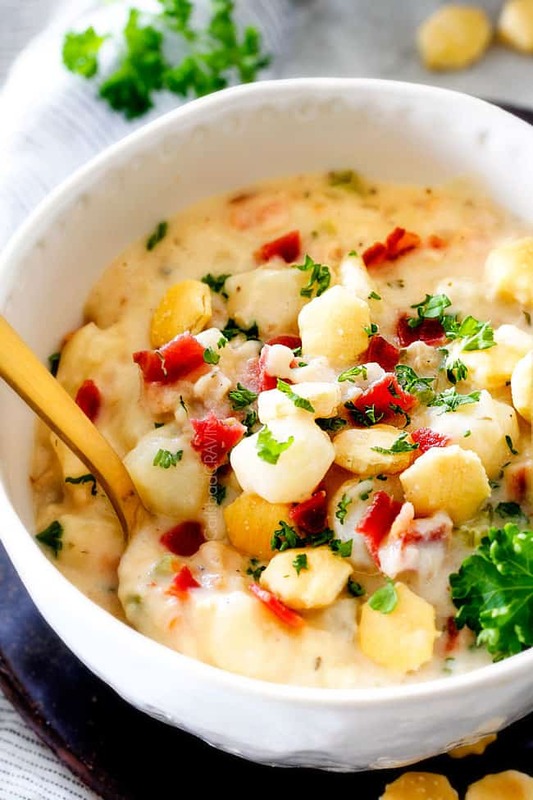 Now dig into your better-than-any-restaurant New England Clam Chowder that’s wonderfully creamy, hearty, satisfying and seasoned to perfection and be prepared to blown away! Looking for more Creamy Soup Recipes? Want to try this New England Clam Chowder Recipe? 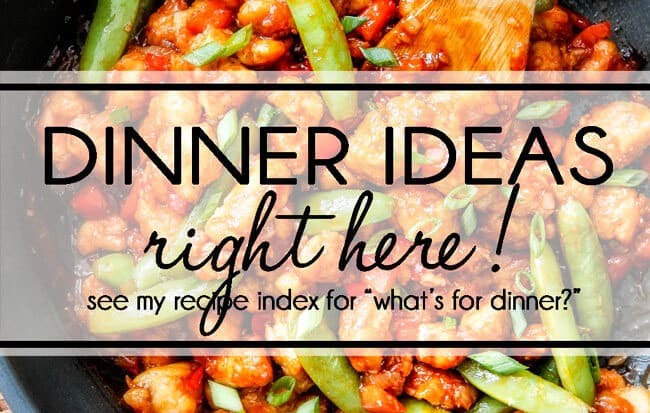 Pin it to your SOUP, DINNER, ONE POT WONDERS or 30 MINUTE MEALS Board to SAVE for later! 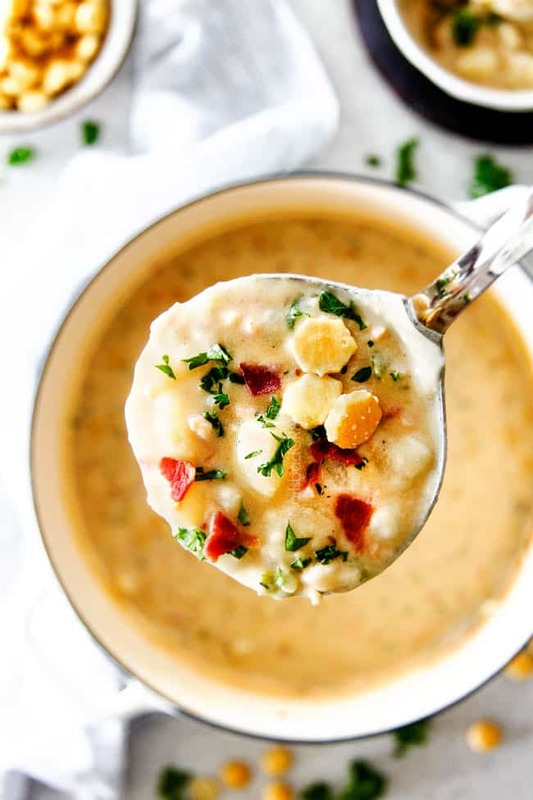 Wonderfully creamy New England Clam Chowder is way easier than you think to make at home and about to become a new family favorite! 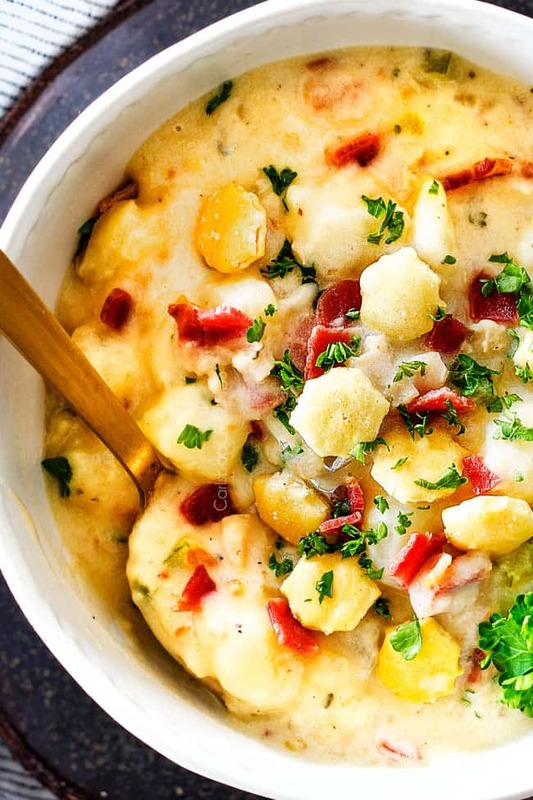 If you’re not sure you loooooove Clam Chowder - this recipe will convert you! 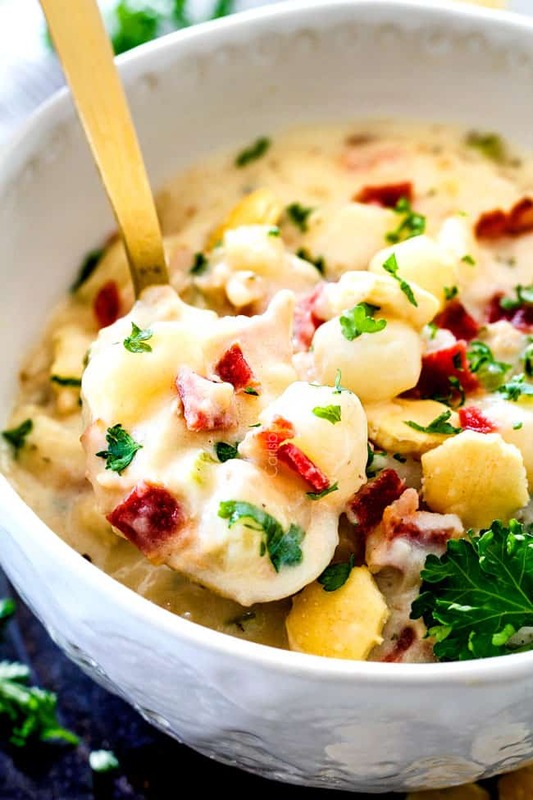 New England Clam Chowder is hearty, creamy and loaded with tender clams, creamy potatoes and salty, smoky bacon in a rich flavor bursting broth! Homemade Clam Chowder might seem intimidating but you will be AMAZED at just how quick and easy it is to make at home in just one pot! I’ve detailed how to use fresh clams or canned clams to make a New England Clam Chowder to rival your favorite restaurant! In a Dutch oven, cook bacon over medium heat until fat is rendered and slightly brown. Remove half of the bacon with a slotted spoon to a paper towel lined plate. Drain off all but 2 tablespoons grease. To the remaining bacon and drippings, melt in 1 tablespoon butter over medium heat. Increase heat to medium high and add celery and onion. Sauté for 5-7 minutes or until onions are soft. Add potatoes, garlic, red pepper (if using) and sauté 30 seconds. Sprinkle in flour and cook an additional 1 minute. Stir in chicken broth, reserved 2 ½ cups clam juice, chicken bouillon, bay leaves and all seasonings. Bring to a boil then reduce to a simmer. Simmer, uncovered, for 15-20 minutes or until potatoes are very tender. Stir in heavy cream and bring to a simmer to heat through. Discard bay leaves. Remove from heat and stir in clams. Taste and add salt/pepper to taste. (You may or may not need additional salt depending on how salty your clams and bacon are.) For a thinner or less chunky soup stir in additional heavy cream/milk or chicken broth. Top individual servings with reserved bacon and oyster crackers and fresh parsley if desired. *FRESH CLAM ALTERNATIVE* - Replace canned clams with 5 pounds of cherrystone clams in shells, scrubbed. (May sub quahogs clams) - You will use the stock of the fresh clams instead of the bottled clam juice. How to Cook Fresh Clams: 1. Add 3 cups water to a Dutch oven and bring to a boil. 2. Add clams, cover, cook over high heat for 5 minutes. Stir clams, cover and cook an additional 2 minutes. Uncover and remove any open clams. Continue to simmer and remove clams as they open up. Discard any unopened clams. 3. Drain the clams and reserve stock, scoop out the meat, and coarsely chop. Set the clam meat aside until the end of cooking (see Soup directions). 4. Strain the clam stock through a mesh strainer lined with a coffee filter and add to a measuring cup to equal 2 1/2 cups. Add additional water to equal 2 1/2 cups if needed. I have made you my main cookbook, I usually do something on Sunday ane it carries me through the week. Sometimes like the chili Mac, more than one meal a day ( I live alone…correction, with a dog and cat). Your Slow cooker Asian caramel pulled pork served on sesame Kaiser rolls with Asian slaw—makes me make loud groaning noises while consuming, so glad I live in a detached house. Waiting on the pineapple slaw recipe you promised. And I will be trying this one to see if it could possible make my friends happier than the barbecue chicken Chile that the threatened to kill me for the recipe, as soon as I finish my pot of lasagne soup. I have a request, my favorite food outside of what I try from Carlsbad Cravings is Hot and Sour Soup from our local restaurant. It is thick and full of mushrooms, tofu, crunchy veggies carrots, red peppers, I think an egg like in egg drop, green onions. It is the best you can do for a cold! I know you could come up with a killer Carlsbad version. If I have to, I will order some and give you a better list of ingredients, I am prepared to take one for the team. :). Thank you for getting me back into the kitchen, I have missed it so much. You’ve made it easy and sooooo tasty! You are my super hero. Oh my goodness Deb, I love your comment so much! THANK YOU for taking the time to write and for your flattery :)! I especially love hearing all of the recipes you have tried and loved – that makes me so happy! Hot and Sour Soup is definitely on my “to make” list but I will rush it to the top! So is your version more like an egg drop soup with a sweet and sour broth? Is that what you mean by thick? Your clam chowder recipe is wonderful! I am a diabetic, I will substitute the potatoes with cauliflower! I am looking forward to making it! Thank you! Hi Mary! Cauliflower instead of potatoes will be prefect! I am so glad you are able to easily adapt it! Delicious, thank you so much. I made this for dinner tonight and the flavor is fabulous. This is the 5th recipe of yours that I have tried and we have enjoyed every one. You are a terrific cook and your recipes make me look like one too!! You are so welcome Susan, I’m so glad you loved it! I am thrilled you have found my site and enjoyed the recipes you’ve tried so far! I hope you continue to find many new favorites! I am honored you are loving my recipes so much Carla, thank you! and I’m so happy this was a hit too even with the non-clam eater! We made this last night and it’s AMAZING! Simple to make and so delicious! Bryan’s first bite resulted in a huge sigh and an “Oh! This is SO good! Mmmmmm! !” And that continued throughout dinner. My reaction was similar, with an added “This is definitely going in the recipe binder!” Thanks for another wonderful recipe we’ll be loving for years and years! This is the best soup/chowder I have ever made……thanks to you! Thank you SO much Julie, that is quite the honor! I’m so happy you loved it!!! This is the second recipe of yours that I’ve tried. This clam chowder is AMAZING! I’m not the best or most creative cook and I usually have bad luck with online recipes, but I feel like I hit the jackpot when I found your site!! I’m really thrilled. We have 2 more meals of this chowder and then I’ll try another new recipe of yours. A sincere thank you for all your recipes and the tips, tricks and info that comes along with them! Hi Penny, what a kind comment, thank you! I’m so happy you found my site as well and have enjoyed the recipes you’ve cooked so far! I hope you continue to have success and discover many new favorites! oh no! I a hope you are able to make it again and really enjoy it! I hate it when things like that happen in a split second! I have never tried making soup before, and clam chowder is my all-time favorite, and this was by far as good or better than any clam chowder I’ve had in any restaurant! I made the whole batch yesterday morning and it’s all gone one day later! And it was only two of us eating it! The only change I made was I used 3 tbsp of butter because…why not, who doesn’t love a rich buttery taste! I might cut back the chicken bouillon a touch so the clam flavor comes through a little more. And I definitely recommend people use the red chili flakes – it gives a really subtle but delicious heat to every bite. My wife said not to change anything because it was the best soup she’s ever had. I love that you attempted making Clam Chowder for your first ever soup – bravo Chris! I’m so please this was better than any restaurant and devoured so quickly! I hope this is the start of much more cooking!